If employees are suffering from burnout, they’re more likely to make mistakes, experience drops in productivity, or start to have attendance problems (i.e. arriving late, leaving early, or calling out of work). Even if only one or two employees are struggling with burnout, managers are likely to notice the effects are office-wide. Once one employee stops pulling his or her weight, other employees have to pick up the slack. This puts added stress on the rest of the staff and can cause a chain reaction of burned out employees. Even if burned out employees don’t affect their coworkers, they are prone to making costly errors that can cause delays. Thankfully, employee burnout is easy to spot. 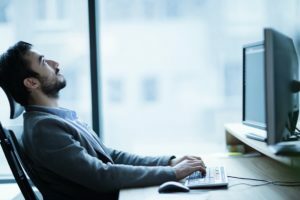 If managers and employers pay attention to their employees, they can recognize key indicators of burnout and take steps to rectify it before it begins hurting productivity and company morale. Heightened cynicism. Once productive employees may begin to balk at requests. A sudden shift to pessimism indicates the employee is disillusioned with or frustrated by his or her work. On that note, if an employee who is known for being a go-getter becomes negative and doubtful of certain objectives or goals, he or she may be experiencing burnout. Mistakes increase in frequency and severity. Seeing more typos when employees are under tight deadlines isn’t surprising. However, when an employee who often performs perfect work begins to make preposterous mistakes, something is wrong. The employee may feel underappreciated or overworked. Employers need to take the time to determine if the mistakes are the result of the employee growing careless or if he or she is suffering from burnout. Sudden disinterest with work. If a certain employee who always has ideas or contributes to the conversation goes silent at every meeting, he or she may be suffering from burnout. If the employee is overburdened with work, he or she isn’t going to engage any further until the problem is rectified. Attendance problems emerge. Some employees struggle with attendance, but when a previously punctual employee starts coming in late, leaving early, or not showing up at all, something is not right. Absent employees can derail projects, hurt productivity, and torpedo workplace morale. Managers need to determine if the sudden attendance problems are the result of family issues, an illness, or excessive work. If the problem is the latter, burnout is the culprit behind the absences. Preventing burnout before it can take hold among the staff is of vital importance to businesses. If your company is trying to contend with absenteeism, Actec can help. Our absence reporting program can improve productivity, reduce absenteeism, and simplify your attendance keeping processes. Contact us to learn more.